Beet kvass is a fermented beverage which has a unique taste and many amazing health benefits. Rich in phytonutrients and other cancer-fighting substances. The word kvass is a Russian word that means “to ferment.” Any fermented beverage, such as kombucha, can be called kvass. In the United States, kombucha has become widely popular during the past few years and is sold commercially in health food stores and even some grocery stores. Kvass is not as well known, but it is essentially the same thing. To some, kvass means “sour beverage” and is still widely available throughout Russia and the Ukraine. The most well-known form of the drink is grain-based, but it can also be made from a variety of fruits and vegetables, including beets. I believe beet kvass is the most nutritious fermented beverage. Probiotics and Enzymes. As with all fermented beverages, beet kvass provides a rich source of probiotics, the good bacteria we need for optimal gut health. The kvass also contains numerous digestive enzymes that originate from the probiotics. Beets also contain juices that can improve the diversity of your microbiome and reducing certain bacteria associated with weight gain. Liver Cleansing. Even when they are not fermented, beets and beetroot juice are well known for their liver cleansing benefits. Beets help your body to naturally cleanse the liver and gall bladder, improve bile flow, and promote regularity. Beet kvass also helps to safely eliminate toxins. Blood Flow and Alkalinity. Beets contain naturally occurring nitrates which convert to nitric oxide inside the body. Nitric oxide helps with circulation and healthy blood flow, dilating blood vessels and lowering blood pressure overall. In addition, beets contain phytonutrients called betalains, which help create red blood cells and will help maintain optimal blood pH, which is slightly alkaline. Essential Nutrients. Beets contain an abundance of phytonutrients such as sulforaphane (found in cruciferous vegetables) that are known cancer-fighting substances. 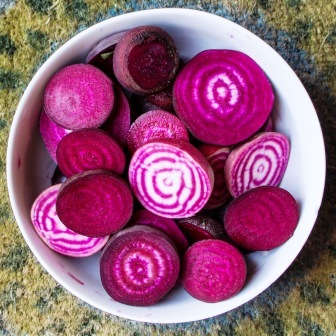 In addition, beets help reduce inflammation and contain many antioxidant properties. Thus, it was not surprising to me when I found out that in Europe beet kvass has been used in conjunction with cancer protocols for many years. Beets are also a rich source of other essential nutrients, including selenium, manganese, magnesium, iron, boron, phosphorous, folate, vitamin B12, and vitaminC. Beet kvass is relatively easy and inexpensive to make, with a little trial and error to suit your taste preference. There are a number of easy step-by-step recipes that you can find online. The bottom line is that you cut up fresh beets (preferably organic), add natural salt and filtered water, put them in a glass jar with a lid, then let it ferment in a dark, warm place for 5 to 7 days. If you don't want to make it, you might find it sold commercially in your local health food store, but it is not widely available in stores yet. I have only found it in one store in my large U.S. city. MyGutMatters.com; Recipe and Benefits of Beet Kvass; 2017. BeatCancer.org; The Benefits of Beet Kvass; 2015.